We're now into the final week before Firestorm, the battle royale component of Battlefield 5, launches on March 25. However, thanks to various leaks we already know some details about the Battlefield 5 Firestorm Halvoy map, the initial combat zone available at launch. 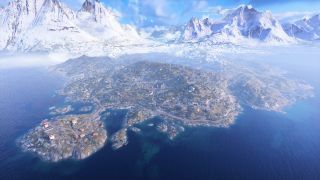 First things first, it's huge - ten times the size of Hamada, the current largest map in Battlefield 5 multiplayer. To manage a map of this size, the Battlefield 5 Firestorm trailer suggests that the burning circle marking the play area will be active from the initial player drop, so it's possible that only certain sections of the Halvoy map will be available for each match. So what else do we know about the Battlefield 5 Firestorm Halvoy map? The Battlefield 5 leaked Firestorm tutorial confirms that there will be plenty of landmarks across the area, as you'd expect from a battle royale map, which will give rise the usual risk vs reward trade off of better loot and increased enemy presence. Completing objectives and tracking down safes to open will give you access to reinforcements, plus rare loot and vehicles that can help turn the tide of battle in your favour. Speaking of vehicles, there will be plenty of different options to help you traverse the Battlefield 5 Firestorm Halvoy map. So far we've seen helicopters, amphibious ATVs (which can drive on land and water), tanks, and... erm, tractors towing hefty mounted guns. Controlling a vehicle can give you a tactical edge, but should be used with a degree of caution as they'll also make you much more visible to opposing players, who can use anti-vehicle weapons and gadgets to take you out. The other thing you need to pay close attention to is the shrinking Firestorm circle itself, as it appears to be completely unforgiving. The trailer and tutorial footage show the fire razing buildings to the ground as it tears a destructive path across the map, so unlike other battle royales such as Fortnite where getting caught outside the circle just leads to a gradual reduction in health, it could be instant curtains for players who get swept into the flames. Battlefield 5 Firestorm launches on March 25, when we'll be updating this guide with everything you need to know about the best locations to land and where to find the most useful loot and vehicles. In the mean time, why not check out our essential Battlefield 5 tips.